There is much written and the occasional walking tour of Jewish Fitzrovia usually accompanied by rather more detail on Soho. However, this all deals with a Fitzrovia that does not exist anymore. The boys and girls clubs in Fitzroy Square and Alfred Place respectively have long gone, leaving just nostalgic visitors to view where they once were or their parents played. This yearning for the past is almost completely disconnected from what may be a far more vibrant Jewish scene in Fitzrovia than people realise. The nostalgia (pain of return because in many cases it was a journey to something painful) may conceal something quite different. The original building was a Victorian construction of great austerity constructed in 1870 which, judging from the pictures of it, must have had hellish acoustics. That year also saw the Central as one of the five constituent communities of the United Synagogue, currently the main umbrella organization for Orthodox Ashkenazi (German or Northern European) Jews in Britain. The Central Synagogue was rebuilt in the 1950s. After the original building was flattened by a German bomb in 1941, it was replaced by the current building in the 1950s, a functional, straightforward if not exceptionally elegant effort. Amidst the high-minded respectability of its members and those who have come to serve and honour it, there is the occasional whiff of scandal in true Fitzrovia fashion. A plaque commemorating the community’s centenary in 1970, unveiled by Reginald Maudling (later disgraced over the Poulson affair), gives one of the honorary officers of the time to have been Eric Miller who not long afterwards shot himself as the authorities closed in on his Peachey property empire. On a more high-minded note, the Central has always been famed for its hazanut (the quality of its cantors). The brilliant Simon Hass was regarded as one of the finest exponents from 1951-1993. You may not have heard the current incumbent, Stephen Lees in Hallam Street, by attending a service but you could have picked him up singing in Trafalgar Square at a festival of Jewish music. While unquestionably Orthodox, Hallam Street, is highly tolerant. Many of its members do not live in the area and so drive or take public transport to and from Shabbat (Friday evening to Saturday night) services which is not officially allowed. In this way, the community keeps members with ancestral attachments who have long since moved away from the neighbourhood. After most Saturday morning services, there is a generous Kiddush (some wine or whisky and lots of food). This is not just an ostentatious gesture. It takes into account the need of poorer Jews to have one proper nutritional meal a day, following an instruction from the United Synagogue’s Head Office. Pride often makes Jewish poverty difficult to identify. By coincidence, the Synagogue is very near the Polish Embassy on New Cavendish Street. When a few years ago, a member of the Embassy staff returned to Poland, the Ambassador and her team all turned up for Saturday morning service for a sort of send-off. Rabbi Marcus told me afterwards what considerable efforts she and her team had made to build friendly relations with the Synagogue and the local Jewish Community. The Rabbi himself is a key player in UK Holocaust education. Hallam Street plays another slightly odd role in London’s Jewish scene. 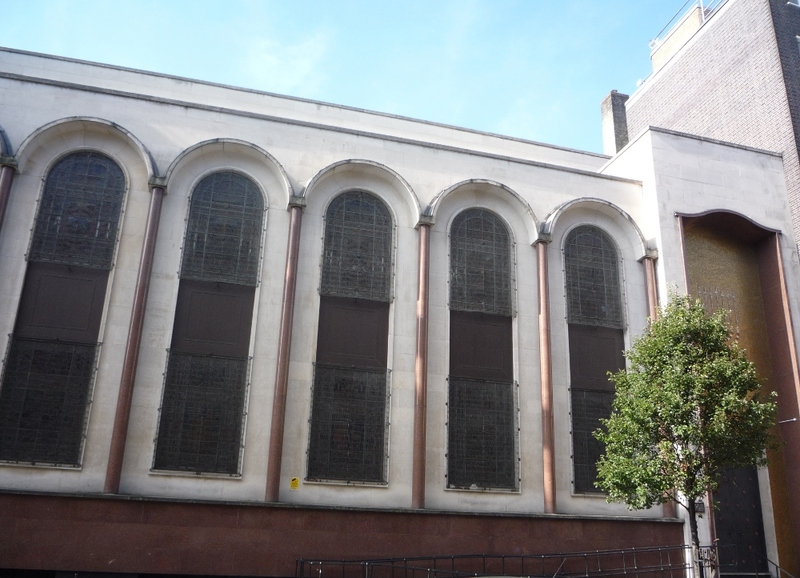 It is the only Orthodox Synagogue between Marble Arch and Bevis Marks on the eastern edge of the City. This means that people working in the West End wanting to attend weekday morning services on the way in and afternoon and evening services on the way home swell the usual attendance. This is inflated further by the private hospitals in the neighbourhood whose visitors can sometimes increase the turn-out. During the week, the Synagogue punches somewhat above its natural weight as a result of all this. The West Central Liberal Synagogue. The other Synagogue, West Central Liberal Synagogue is a much less conspicuous affair. 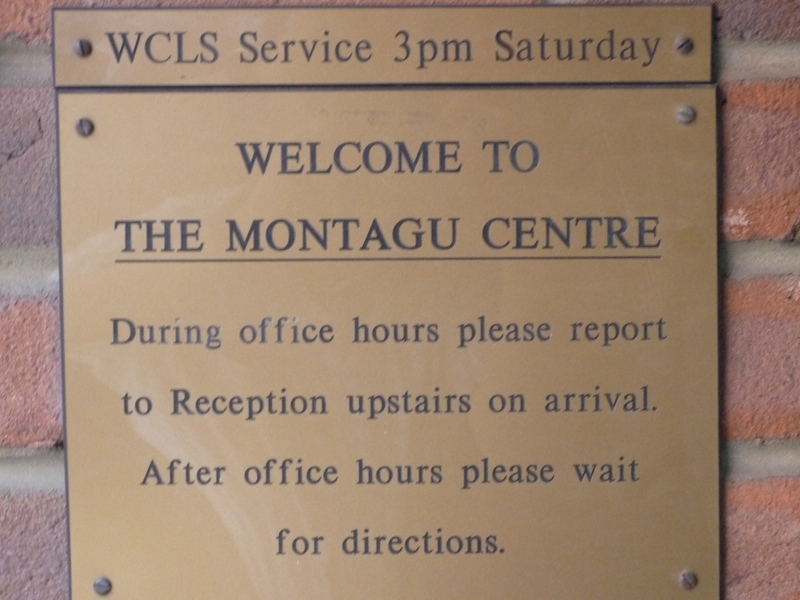 The Lily Montagu Center commemorates the sterling efforts of Miss Lily, the sister of Ewen Montagu (the man who created Operation Mincemeat involving the depositing of a stray body on the Spanish Coast in World War II to confuse the Germans over the invasion of Sicily). It was once the site of a larger synagogue and is now the offices of the Liberal Jewish movement. 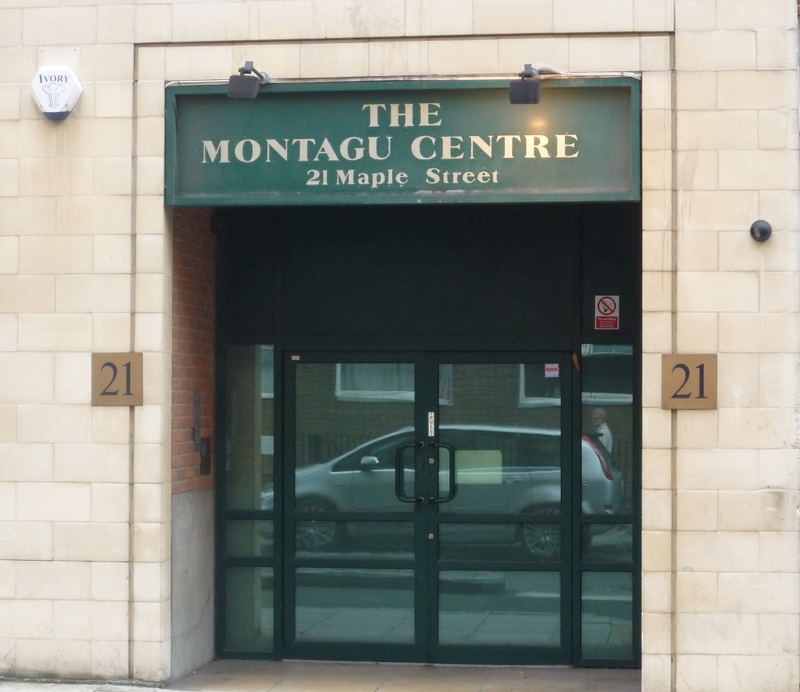 Lily Montagu famously created the Jewish Girls Clubs in Fitzrovia and Soho among her many acts of commitment to Jews and Liberal Judaism in particular. She instituted the mid-afternoon Saturday service for people who could not take Saturday morning off work and the services still continue in the building’s basement. However, the community shares a Rabbi with a community in Ealing and is more notable for its quirky informal reputation than its great local impact. The only clue to the building’s use. Liberal Judaism is the most radical of the types of Anglo-Jewry with great emphasis on accepting everyone who wants to participate, much less formality and equality of participation between the sexes. Unlike its Orthodox counterparts, it also conducts civil partnership ceremonies and generally handles the impossibly awkward situations (Church funerals of Jews notably) from which everyone else in the Jewish world tends to stand back. A curiosity is that, like Hallam Street, WCLS has a foreign Rabbi. Janet Burden is from the US while Barry Marcus and his hazan (cantor) Steven Lees both come from South Africa. It is easy to say that the Jews have left Fitzrovia. They are certainly less numerous and conspicuous than before 1939. After the War, Jews led the post-war exodus to the suburbs. However, standing on a street corner a reasonable distance from Hallam Street after a Saturday morning service reveals rather more people walking home afterwards than one might expect. There are more Jews in this part of the West End than people think. Jews have always played a prominent role in the many Universities, film, music, media and rag trade businesses in the area. Adding the resident population to the working one, one might find rather more Fitzrovian Jews than people think. This does not reflect itself in the stock carried by supermarkets or other suppliers. Kosher food counters are minimal in Tesco and non-existent in Sainsburys. The nearest Kosher Restaurant is in Baker Street. Jewish shopping generally involves a trip on the Northern Line! 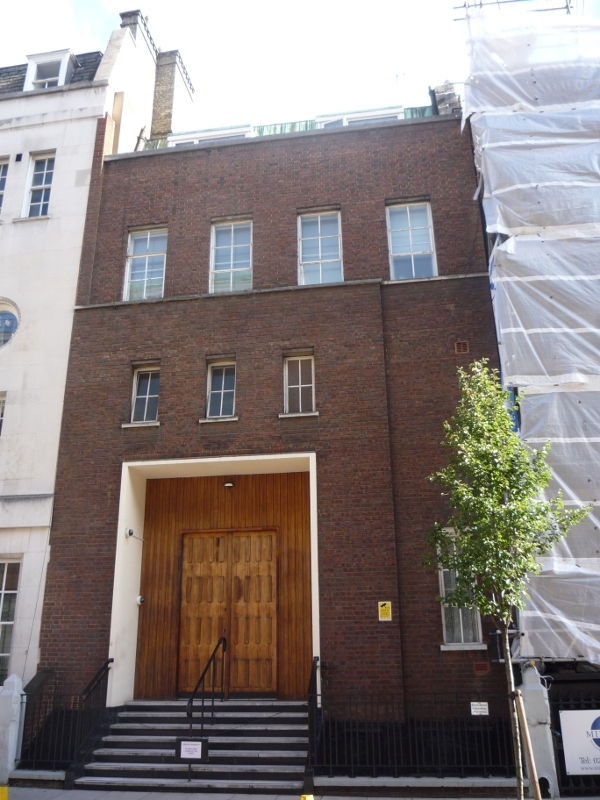 It sometimes seems like after the mass folding of Soho Synagogues after 1945 into the Dean Street Synagogue which closed in the 1990s, people are scared to proclaim a Jewish presence in Fitzrovia for fear of announcing a false dawn. In truth, Jewish Fitzrovia is not going back to the pre-war population and that is a good thing. The grinding poverty and sweat shops were not healthy for anyone. The new Jewish Fitzrovia is middle class, generally quite comfortable, and either living, or with roots, in the suburbs. It may have consciously or otherwise adopted the view of a well-known politician’s PA who was fond of saying: “don’t look back; you’re not going there”. Thanks that was very interesting I had no idea about montage house and I work virtually next door!